More than 2,000 Peterhead football fans are preparing to travel south to Hampden Park on Sunday to cheer on their local favourites as they take on the might of Rangers in the Petrofac Training Challenge Cup Final. It is, by some distance, the biggest game in the 125-year history of a club that was in the Highland League until 2000 and is currently sitting second top in Scottish League One. Despite the current odds showing the Balmoor side at 7/1 to win, while Rangers are clear favourites with odds of 1/16, the Blue Toon army remains undeterred and is set to make its voice heard at Scotland’s national stadium. To help fans make the 360-mile round trip from the north-east, the club worked with local firm Victoria Coaches to organise 15 official supporters’ buses to travel to Glasgow on the day. Twelve buses will depart from the club’s Balmoor Stadium at 9am on Sunday morning, with a further two coaches leaving from Ellon and the remaining bus setting off with supporters from Aberdeen’s AECC. 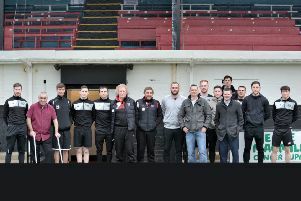 Ten companies – MB Plant, Kevin Coutts, SBP, Kerloch Oil Tools, James Jamieson, LJF Powder Coating, TWMA, Masson & Glennie Fraserburgh, Masson & Glennie Peterhead, and Peterhead Port Authority – stepped forward to sponsor the supporters’ buses and back the club which is playing in its first senior national cup final. The streets of the Blue Toon will undoubtedly be quieter on cup final day as those who didn’t manage to get a seat on the supporters’ buses watch the live broadcast of the game either at home or in the town’s pubs and hotels. In the weeks leading up to the cup final, there has been a heightened sense of being part of a community in which something special is happening. Photos, scarves and strips can be found adorning shops and businesses throughout the town and locals have been voting in an online competition for their favourite public show of support. Nearly 900 votes were cast from as far afield as the United States, Germany, Romania and South Africa. Proud winners, with 45% of the total number of votes, was Genesis Personnel in the town’s Marischal Street. Meanwhile, pupils at local primary schools in Peterhead and the surrounding area took part in a banner competition with all entries being taken down on the supporters’ buses for display at Hampden. Two of the banners will be taken into the national stadium and used by fans to cheer on the side. Support for the Blue Toon has also been flooding in from well known faces. Scottish professional golfer, Jamie McLeary, who was born in Peterhead, was keen to send a good luck message to his hometown club. Peterhead skipper and TV personality, Jimmy Buchan, has been another fan eager to add his support to the team. The star of BBC’s Trawlermen series is an avid Blue Toon follower and is confident that the players will rise to the big occasion. The New Zealand branch of the Blue Toon army is also getting behind their team and will be cheering them on from 11,500 miles away. Wellington-based Craig Buchan, who has run the Peterhead Prediction League on the fan forum for the last decade, describes himself as a “devoted fan from afar”. Despite both the distance and time difference, Craig, who is known by the nickname ‘Bonzo Buchan’, will be keeping a close check on the score line at Hampden. The Aberdeen-born father-of-two, who works for the Bank of New Zealand, has supported the Blue Toon since two of his school-mates began playing for the club and has been devoted to the side ever since. With cup final fever now engulfing the Blue Toon, the support which has already been demonstrated in recent weeks has been gratefully acknowledged by the club who say the team really appreciate the show of support. Regardless of the result, April 10, 2016 looks sure to go down in the club’s history and if Peterhead upset the odds, the rewards will be higher than anything they’ve seen before.